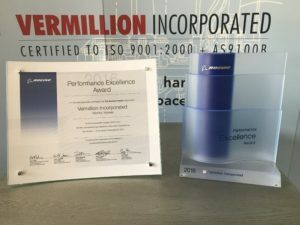 Trophies awarded to Vermillion by The Boeing Company for Superior performance. WICHITA, KS – Vermillion Incorporated today announced that it has received a 2016 Boeing Performance Excellence Award. The Boeing Company issues the award annually to recognize suppliers who have achieved superior performance. Vermillion Inc. maintained a Silver composite performance rating for each month for the 12-month performance period, from October 2015 to September 2016. Jared Peterson, Vermillion Inc., President and CEO said: “It’s an honor to receive such a prestigious award from The Boeing Company. Superiority in Quality and Delivery are characteristics that Vermillion strives to achieve, so it is very meaningful to be recognized for those attributes by Boeing. As we continue expanding capabilities, milestones like the Boeing Performance Excellence Award signal to aerospace and defense industries that Vermillion is a company worth serious consideration.” This year, Boeing recognized 480 suppliers who achieved either a Gold or Silver level Boeing Performance Excellence Award. Vermillion Inc. is one of only 402 suppliers to be awarded the Silver level of recognition. About Vermillion Incorporated: Originated in 1965, Vermillion Incorporated specializes in bulk cable, wire harness, and cable assembly manufacturing primarily supporting the Aerospace and Defense industries. Vermillion’s proprietary cable shielding material, Vermalloy, is known throughout the industry as one of the most effective cable shielding products available for EMI protection.